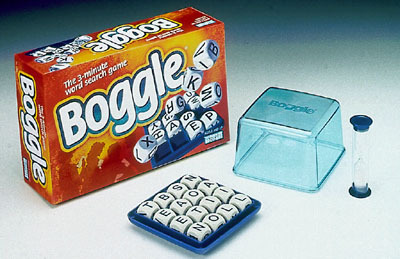 Recently had to figure out how to program a Boggle algorithm. Boggle is a simple board game I never had the pleasure of playing by itself, but have played plenty of related variations of. These kinds of algorithms are pretty interesting and I had a lot of fun programming different solutions. I’ll share 2 solutions. Boggle is relatively simple. I never had the pleasure of playing by itself, but have played plenty of related variations of. You have a square game board with dice of various letters that is n x n. The board gets shaken/randomized and a timer starts. The player scores points by finding valid words on the board that are longer than 3 characters, with longer words scoring more points. The rules are that letters have to be adjacent or diagonal to the last letter in the word to continue. And you can never repeat a letter you’ve already used, so while you can have multiple of the same letter, its the die itself you can’t return to. I decided to tackle it in C++. This entry was posted in Portfolio, Programming Gems and tagged algorithms, C++, cpp, gems, how-to, programming, puzzle on October 18, 2014 by Anthony Barranco.